Replacement Part, Sommer Gate Operators - Art.-No. ... ? Elektromechanik Haus und Tor ! We are a company based in berlin and offer the project engineering, assembly and maintenance of the complete building services from one hand. Many ranges can be co-ordinated: e.g. the integration of the door substation into the Tk-plant of the building or completely galvanized and powder-coated fences, gates and posts including the mounting straps for the gate operator technology. In our online Shop you find Chamberlain (LiftMaster, MotorLift, CWI, PowerDrive), Beninca, BFT, Motorline - garage door openers, sliding gate operators, wing gate operators, barriers, replacement parts and accessories like e.g. 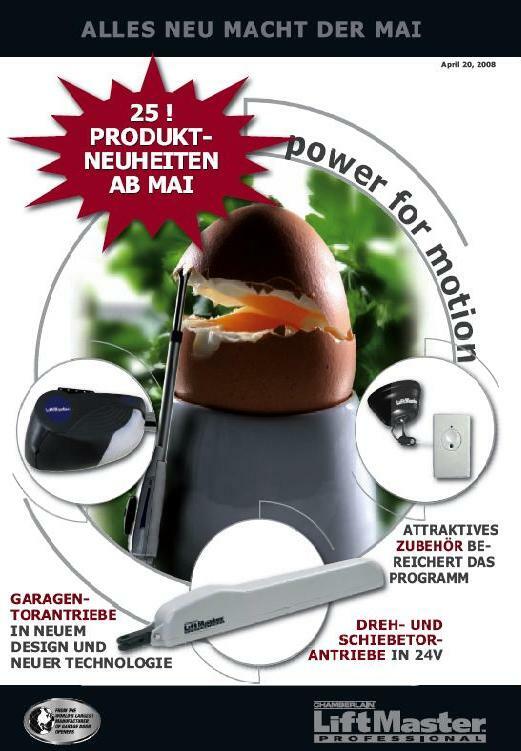 controls and hand transmitters for garage gates, sliding gates and wing gates. Further emphasis is the single and wholesale of fence plants (wire mesh fence, mat fences, lattice fences) as well as mail box plants and fence mail boxes from own manufacturing after customer's request. We repair defective drives, engines and pistons. Send to us your def. HC 250, HC 300, HC 400, WGO 300 or WGO 400 and you receive for e.g. 69.95 € (def. Engine) o. for 89,00 € (def. Pipe with lever) a regenerated drive in the exchange. We supply spare parts for Chamberlain, LiftMaster, MotorLift, PowerDrive, Homentry, HomeAccess, Motorline, Beninca, BFT, CWI-electronic, Bosch-Motor and Garog. Tell us where, and at what price, and we will consider whether we can keep the price.